We’d love your help. Let us know what’s wrong with this preview of Shadowhunter by Leena Maria. Dana’s best friend Kitty has died in a car accident, and the only ray of light in the misery is when her grandmother appears in her spiffy red sports car to cheer her up. At the same time a nightmarish shadow appears to hunt Dana and she has to flee from her ordinary life with grandma, who turns out to be something quite different than what Dana had thought – a Huntress of Dana’s best friend Kitty has died in a car accident, and the only ray of light in the misery is when her grandmother appears in her spiffy red sports car to cheer her up. At the same time a nightmarish shadow appears to hunt Dana and she has to flee from her ordinary life with grandma, who turns out to be something quite different than what Dana had thought – a Huntress of Shadows. The truth about her ancestry is not an easy thing for Dana to accept – she was deliberately created to perform a task, to find something that should stay hidden, or it might threaten the world of humans as Dana knows it. Her existence is tied to the myth of the Nephilim, the descendants of angels, and her creator was someone who commands the forces of chaos and darkness, the source of all horror myths of humankind. Dana learns there is a world of shadows, the afterlife, dreams and time travel, surrounding the physical world, hidden behind a thin veil – and that there are ways to enter it from the physical world. Dana has no option – she is being hunted by creatures of darkness, and the hunt can only end in either Dana and everyone she loves being captured and turned into creatures of darkness – or Dana finding what she was created to find. Her hunters have skills no ordinary human can escape – but Dana is not an ordinary human. Nor is Daniel, the leader of a hidden Center fighting the darkness. 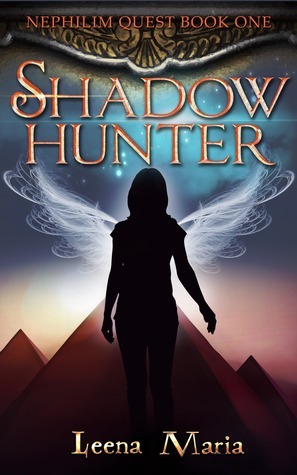 Together with a chosen team they could travel the Unseen Worlds that surround the physical world, into the past, following a clue written down in ancient Egypt, and then walk the Trail of Angels, and find the hidden mystery before the dark creatures do. To ask other readers questions about Shadowhunter, please sign up. Is there a sequel to this book? A bit immature but interesting story. Please read to the end. I was intrigued by this book and purchased it as something to read through the Summer. About 75 % into the book I had mixed feelings. Without giving away spoilers, I found the author is using certain terms (like Nephilim, Shadows, etc) somewhat interchangeably and it's hard to figure out who's who, who came from whom, who made whom and who's good and who is evil. There is also very little differentiation between characters in the style A bit immature but interesting story. Please read to the end. I was intrigued by this book and purchased it as something to read through the Summer. About 75 % into the book I had mixed feelings. Without giving away spoilers, I found the author is using certain terms (like Nephilim, Shadows, etc) somewhat interchangeably and it's hard to figure out who's who, who came from whom, who made whom and who's good and who is evil. There is also very little differentiation between characters in the style of talking, behaviour and how they are written down. They all sound the same and the character development is, well, in the development stage. The author does a lot of "telling" instead of "showing" and there are some long passages of explanations which could have been handled better as opposed to sounding like wiki page excerpts. The romantic stuff is written stiffly and I found it unconvincing. I was not able to connect with it, as much as I love a good love story intertwined with my fantasy. And, for goodness sake, why would an author name their characters so similarly? Dana, Diana and Daniel, who interact throughout most of the book? And then we have Lilith and Layla. It's probably a personal peeve of mine, but I like my characters to have distinct names that do not sound the same so the reader doesn't have a hard time remembering who's who. It's confusing. There are also a lot of typos in this book. In general, the writing seems a little immature and I think this author has a lot to learn yet, however, there is a lot of potential, too! If you love adventure then you will love this book! At first there is a lot of information to take in and at times I found myself slightly confused. Then all of a sudden something just clicked and understanding flooded in opening up this fantastic new world! The story is completely original, I have never read anything like it. Not only is it a fantastic story, it is also brilliantly educational. A lot of history, specifically Egyptian (which I found fascinating) is to be found. It is clear that a If you love adventure then you will love this book! The story is completely original, I have never read anything like it. Not only is it a fantastic story, it is also brilliantly educational. A lot of history, specifically Egyptian (which I found fascinating) is to be found. It is clear that a lot of research, time and effort has been put into this fabulous read! The story has a few different narratives that kept me guessing as to the connection to each other, and offers many twists and turns that I just didn’t see coming. So many layers have been placed in this book and every moment spent unraveling them has been an absolute pleasure. Leena has created some fantastic characters and really made me connect with them in ways that many accomplished authors have failed to do. Nephilim Quest is the debut novel by Leena Maria and it is one you don’t want to miss! I enjoyed reading the book. It was exciting. I felt like I was right by the character s it was easy to read I loved the story. I would like to read the next book. very captivating and thrilling book. I enjoyed reading and want to continue reading the next book from this series. The writing of Leena brings a nice feeling. Leena Maria writes novels that have one thing in common: ancient Egypt. Though her studies have been academic, the books celebrate the power of imagination. History is definitely not dry in Leena’s novels! Warfare and Weapons in An Leena Maria writes novels that have one thing in common: ancient Egypt. Though her studies have been academic, the books celebrate the power of imagination. History is definitely not dry in Leena’s novels!